One Sunday afternoon this summer I was called in to perform an emergency surgery on Indy, a three-year-old Rhodesian Ridgeback. He had been vomiting, not eating and acting very lethargic for a few days. At presentation he was very painful in his abdomen and febrile; we were concerned with a foreign body that was lodged in his intestinal tract. Initial blood work and X-rays were what we call unremarkable, meaning that they didn’t show any obvious abnormalities. Still, despite aggressive supportive care for 24 hours Indy did not improve. Indy’s owner elected to perform an abdominal exploratory surgery with the understanding that we might not find anything. Indy was prepped for surgery and I entered the abdomen. The first thing I noticed was that his liver had a laceration that I could not explain. (Given that he is a very deep-chested dog there was little chance that I caused the laceration when I cut into his abdomen.) I examined all of Indy’s abdominal organs and did not find any foreign material or abnormalities. When this occurs we take samples of everything and submit it to a pathologist for review. Indy recovered well from surgery and went home a few days later. His owner called to report that though he had done well initially, once again Indy was not acting like himself. 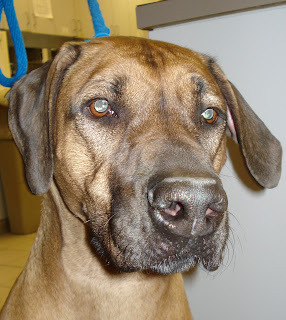 We managed his post-operative pain and treated the diarrhea that had developed with oral antibiotics. Still, Indy was not himself so his owner brought him in for a follow-up exam. During this visit, I saw that his back seemed sore and we decided to try another course of pain medication and rest. He continued to have soft stool despite treatment with antibiotics, so we prescribed an additional antibiotics as well as a de-worming medication. The biopsies that were submitted after his surgery were unremarkable and did not give us an answer as to what was going on with Indy. In September, a little over a month after the surgery Indy came back in for a mass that developed on the side of his chest. At first a needle aspirate revealed a benign mass called a lipoma but over the next four months it developed into an abscess. We cultured the wound and started treatment with a broad spectrum antibiotic. During the months of November and December the wound responded slowly to antibiotics and warm compresses. But in the beginning of January it became very large again and developed a draining tract. At this point we decided to perform surgery to remove the mass in case it might be cancerous. Dr. Begnoche performed the surgery and we were all very surprised with what she found. From the center of the abscess she removed a large toothpick, the kind that is usually seen holding a sandwich together! Our best guess is that Indy ate the toothpick, presumably while it was still in the sandwich, and it migrated through his stomach, diaphragm, and chest wall, ending up trapped under his skin. This explains the odd laceration I found in his liver at surgery and why he never seemed quite right since his initial presentation in July. I am happy to report that Indy is now doing great and has made a complete recovery. For me, this served as a reminder that owners know their pets best and if they feel something is off, it usually is. Indy’s owner was incredibly dedicated to the extensive nursing care he required at home for many months. Indy’s story is yet another example of the amazing things that can happen at Friendship with our talented, highly skilled doctors, a wonderful owner and a very brave dog.